MAHE will be prescribing the exam pattern and subject-wise syllabus. Candidates can either visit the official website or check all the information here. The Manipal University entrance exam 2020 will be conducted in online mode. To start preparing for the examination, candidates must check both the syllabus and exam pattern. Candidates should carefully check the marking scheme and practice question papers. Candidates will be allowed to navigate through the questions. All appearing candidates should reach the exam hall before the scheduled time. The exam will be held in the online mode i.e. in computer-based mode. Each candidate will have 2 hours 30 minutes to complete the entire exam. Questions will be objective type and there will be multiple choice questions. There will be a total of 200 questions. The distribution of questions will be as follows: Physics – 50 Questions, Chemistry – 50 Questions, Mathematics – 70 Questions and English & General Aptitude – 30 Questions.4 marks will be rewarded to each correct answer and -1 will be deducted for each wrong answer. Firstly, Know the correct syllabus to gather the right study material. Prepare a timetable on a daily basis in order to manage time throughout the day. Take the mock test that will be made available online on the official website. 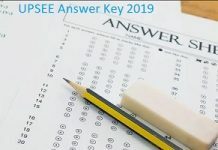 Solve as many previous years question papers as you can. Understand the concepts and make short notes wherever possible.